The home was more ornate than it needed to be. Marchesa's mansion towered over the palatial homes of her neighbors, each extra story a mark of her success. While the rich afforded three to four stories on their homes, Marchesa had nine, seven of which were mostly unused, although they served their purposes. 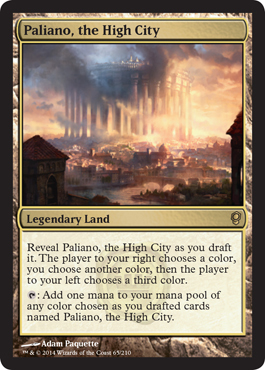 Situated among the elite of Paliano, the High City, Marchesa was entertaining a guest and business partner from the lowlands, Ervos Trax. Marchesa and Ervos were longstanding business partners. Marchesa's network of spies and rogues controlled much of the High City, while Ervos's criminal empire stretched from the lowlands all the way to the city of Talon and the docks beyond. 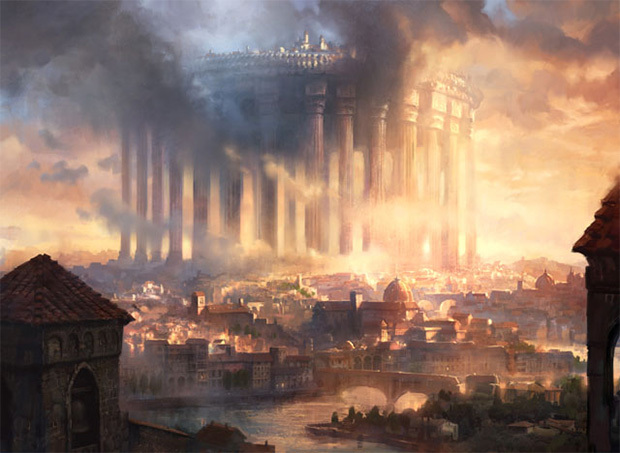 Despite his power in the lowlands, Ervos was still not of the High City. His best clothes, which he had clearly worn, were fancy to lowlanders, but out of date and less impressive to a High City noble. Ervos had made the arduous trek up the Thousand Steps into the High City from the lowlands. Marchesa had invited him to dinner but she didn't send a ship to bring him to her—although she owned several staffed with pilots. Marchesa and Ervos were sitting in Marchesa's third-best dining room, which afforded them a more intimate meal. Instead of sitting at one end of a massive table meant to entertain two dozen, Ervos sat across from Marchesa. Ervos was not yet middle aged, although in his line of work that would make him ancient. He was arguably handsome, with sandy brown hair and straighter teeth than most. With his good looks and undeniable charm, he had exploited his first victims. Although he wore last season's fashion, a somewhat garish suit made of golden cloth, Marchesa did note that Ervos still looked pleasing to the eye. Marchesa wore her raven-black hair pinned up with ornate pins. Nobles and thieves all wondered why Marchesa insisted upon wearing the fashion of the older women in Paliano, although she was only slightly older than Ervos. Even now, at a more casual dinner, she wore the dress one would typically see in the High Chamber during a vote worn by a senator falling asleep as the call was tallied. Some suspected she dressed this way to assert the role she wanted upon others, while others whispered the Black Rose thought herself the ruler of the city. Ervos always smiled at these rumors, for he knew Marchesa dressed that way simply because she liked the clothes, and although she was a woman of grand ulterior motives, her clothing had none. She wore the style of the elders well, Ervos thought, somehow remaining fluid in her movements, using her arms to speak and walking quickly when talking, although the style was typically worn by the slow and rigid. Marchesa also wore a ring on each finger, each expensive and ornate. The biggest was the ruby she wore on her left middle finger. Each ring housed a different poison, but the ruby contained the deadliest on Fiora. Here they sat, regal and dignified, two killers slowly eating their meal of roasted lamb and steamed exotic vegetables. The only sound in the room was the clank of silverware against plates, the knives cutting the lamb through and scratching the plates underneath. Then Ervos, without looking up at his hostess, spoke. "I think I am going to have you killed," Ervos said, then took a bite of a hunk of over-buttered bread. Marchesa stopped cutting her food, but only briefly, and continued to carefully cleave her pork. "Oh?" she replied after the silence. She took a bite of her food, eyes fixed on her plate. "How would you go about that?" Ervos looked up at Marchesa and pushed himself back in his chair, sitting up straight. "It would be a challenge, I'm sure, but I do have a plan," Ervos said, confidently. Marchesa took a sip of wine and then broke some bread from the basket in front of her. "And why would you wish to kill me?" "Business, pure and simple. I tire of making the trek up the stairs, and my network is now steadily moving into the High City. You, Dear Friend, are my only obstacle. And I know you would never allow a rival to have that much power in your city." "I see. But please, do not tantalize me with vague notions," Marchesa said, almost teasing. "I must know how you would plan to end my life. Share the details." Ervos placed both hands on the table and smiled. "Well, of course I could not attack now. You have at least two... no, three men, in your walls. I don't hear any breathing, although I do notice that this palace of yours has a strong smell of yantal root. That means you are trying to cover up a smell, so I would guess zombies, most likely bound to protect you if you or they sense danger." Marchesa leaned back in her chair, smiling, as she sipped her wine, holding the wine glass nonchalantly to the side as she rested her arm on the armrest. "I would never make it out alive," Ervos continued, "even if I did strike you down where you sit right now and used a spell to render the zombies inert, I would still need to leave the house. I would have two avenues of exit, the yard or sewers—which I know, after murdering the city registrar and stealing the plans to your home, connect to your basement. The yard would be covered by the archers perched on your rooftop, and the sewers no doubt run me afoul of that damnable Grenzo you have arraignments with. Likewise, I highly suspect that if I were to murder you I would, of course, be afflicted with some sort of dark curse that would leave me in a state of horrible pain, but never allowing me to die." Ervos chuckled. Marchesa took a drink of wine. "Why would I leave real plans of my house with the registrar?" Marchesa asked. "Of course, they are not the real plans, although no doubt you would have had enforcers threaten the registrar so he would think they were real, and keep eyes on the man so if he was approached by another you would know. Which would mean the basement wouldn't even lead to the sewers, or if it did, might drop me into a chute that would have me fall out of the city, plunging to sure death into the lowlands beneath." "You give me much credit, Ervos. I thank you for the kindness." Marchesa placed her glass on the table and leaned forward, resting her head on the arch she formed with her hands. "Please, do go on." "Knowing that the registrar would be a dead end, pardon the pun, I would instead have to think about how to strike from a distance. Now, my first guess would be to poison your food, but as that is one of your favorite motifs, you would be well prepared for this maneuver. I imagine you get your food from different locations, some even from the lowlands, using different couriers each time, so as to not give anyone the opportunity to tamper with your meals. I am also fairly certain you would feed your food to—no you are not cruel enough to do this to an employee—but maybe to rats or goblins, to see if they keel over. So, killing you through your food would be out of the question." "It's good to know this wasn't my last supper," Marchesa commented. "I would have preferred a better vintage of wine." "Quite," Ervos agreed. He leaned back in his chair. "And as I've already mentioned, your home is a safehold. 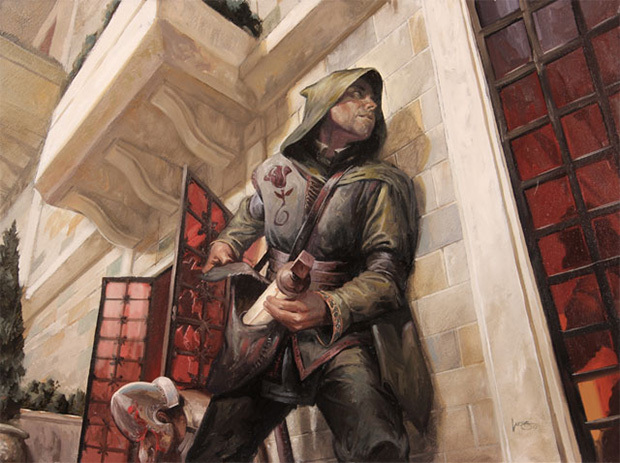 You do not travel regularly, but when you do, you travel with armed guards and agents dressed as nobles and street folk, with some running along the rooftops. A direct assault on you would leave many dead, and you have enough contacts that garnering support would be difficult. Word of my sedition would eventually reach your ears. Even if I tried to recruit a gang of goblins or Custodi guards, you would most likely know." "It seems like I have nothing to fear," Marchesa said, still smiling. "Oh, but you do, for there is your weakness," Ervos said, now taking a large drink of wine. "We both, as a hazard of our business, rely far too much on others. What is a spider when it cannot trust its web? People can be broken, people can be made to turn. So with those who protect you and act as your agents throughout the city, all I would need to do is find someone in your organization I could own." "Very true, of course, but which player would you invest into this role?" "It would be a matter of access. Those in your personal guard and your house servants would be harder to meet with; I imagine each spying on the others as part of their position. I would need to find someone on the outside of your operations, someone who would get orders from those you give orders to, but not so far removed from the top they don't know anything. I would need someone like a foreman who oversees shipments or a bookkeeper who distributes funds to your assassins. I would need someone like..."
Ervos coughed and drank some wine to calm his throat. Marchesa took the opportunity to take more bites of her food, moving from meat to vegetables, which were slightly cold now but still expensive and delicious. "Yes," Ervos said, still fighting a cough, his face slightly redder from his fit. "As one of your sub-lieutenants, Pietro Lokosh would be the sort of person I would use. I would use an agent of my own to find out his weaknesses, like his family. And then I would extort him, with threat of violence, into giving me information about how you move your personnel. I'd gather information over the course of a few weeks to see where you would be most vulnerable, even if it would just be an attack against your pocketbook." Ervos began to cough again, this time producing blood into his hands, which he quickly wiped up with a cloth napkin that had been on his lap. Marchesa saw this, although she did not acknowledge that fact. She spoke while he coughed. "I would, of course, suspect such a subterfuge and end Pietro Lokosh's life as a precaution. 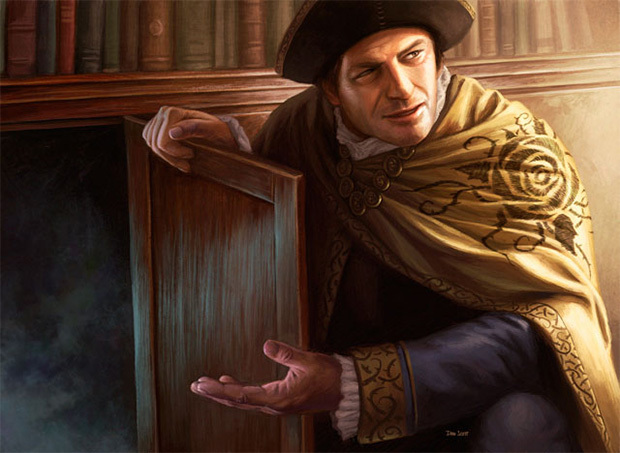 Likewise, I would locate your spy and flip his allegiance with the promise of gold, allowing me to keep better tabs on you, feeding back the information I would want you to hear, until I decide to kill the spy and retrieve my gold. For good measure." Ervos nodded as she spoke, still coughing into his bloody napkin, face redder than before, and held up a finger asking her to pause. "I would, of course, know that the spy would be used against me," he said, speaking through the coughing, blood now splattering onto his plate of unfinished food. "I also know that any person in my organization would ultimately be corrupted by your promises, and I could never trust someone who had ever been in your employ. I also know I am just not as adept at knowing people as you, seeing all the variables. I admit that as my flaw. I would know I would not be able to kill you, but as our businesses continue to square off against the other, one of us would have to die. So instead of letting you kill me, I would poison myself, knowing I would be dead despite any schemes I might plan." Marchesa nodded, the smile now gone from her face. "I am impressed, Old Friend. I will say that I am shocked by this play. I had planned to have you killed at your secret penthouse in your sleep two nights from now. It seems I will be blamed for your death and face retaliation from your associates." She leaned forward. "This was a good play." Ervos smiled, now shaking as he tried to hold himself up in his chair, but then slumped forward, face into his plate, dead. Marchesa sighed and fidgeted with her rings. She stood up, pushing her chair back, and walked over the Ervos's body. She wanted to kiss him on the forehead, but she knew Ervos would have put poison on his skin to prey upon any compassion she might show. Instead, she walked out of the room to summon her butler, who had been in the backyard since before Ervos arrived, digging a hole for his body. 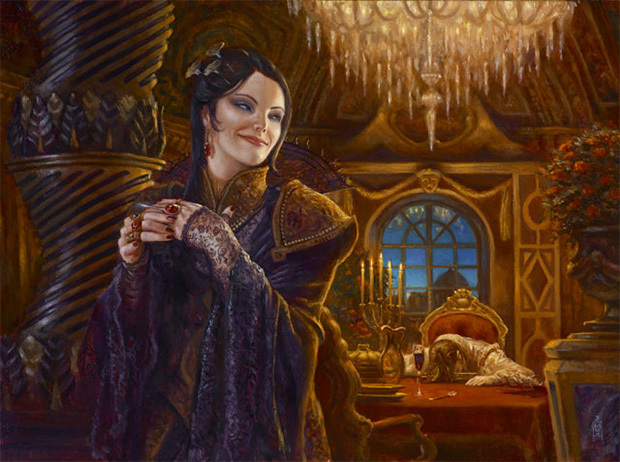 Marchesa knew her rival would take his own life, but she wanted him to have the final victory as he died, even if she had known his play all along.